Prevent water marks on your tabletops and bar by presenting beverages with this classic Choice 2-ply white beverage / cocktail napkin. Featuring an elegant, embossed border this napkin accents your beverageware. Thanks to its pure white color, the various hues of your vibrant mixed drinks and garnishes pop! Plus, the absorbent 2-ply design keeps moisture in the napkin and off your countertops and it's soft to use. These are good quality napkins. It is worth it to me to go to the 2 ply napkin for our party. They will look great for the bar and appetizers. Purchased these napkins to be served with fingers food. They actually have embossed roses, which give them a nice touch. Very nice quality and perfect size, just what we needed. Thanks. All napkins arrived in great condition, photos and description are very accurate. Much nicer to serve to customers than sheets of paper towels. Highly recommend. its exactly what it says it is. a thin, small napkin that you hand out with a cocktail or beverage. it is a cheap small napkin. These are the perfect sized cocktail napkins. Ordered them to use for our appetizer section for our upcoming wedding. They are high-quality 2-ply so they do not fall apart easily. Great product and to the best of my knowledge unbeatable price for 2 ply. Big box stores sell one ply beverage napkins for about the same cost. Can't go wrong here. They work great for my the bar. A lot better price than I was paying for them. Now that I know the quality, I might order them with my logo printed on them. I mean...it's a napkin. But it's a perfectly good napkin at a really great price. I couldn't buy anything this quality in a store for such a small amount. These are excellent napkins! We like that you can use multiple of them for very cheap. They are a vibrant white, and stand out with silverware. We go through thousands and thousands of these napkins and for a simple napkin the price is right. It is very basic but sturdy that is doesn't just fall apart once a wet glass touches it. I will keep ordering these napkins! These napkins are a perfect size for my customers buying baked goods. The price is good especially for the quantity. I plan to order this item again. Perfect size for customer use at a coffee shop. We get these on a regular basis and have not had any problems with them. They are pretty sturdy but also soft. They are packaged well for stacking when it comes to stocking. The Choice two hundred and fifty pack of two-ply white beverage napkins has met all of my expectations. I was pleasantly surprised at their absorbency. The white is a very clean white that looks great on any linen tablecloth. I would definitely order them again and would highly recommend. These 2-ply beverage napkins by Choice are an excellent value and they work well enough for most circumstances. Our one "complaint" is that we do not care for the imprinted design, although it is not that noticeable so not a huge deal. We love these small napkins. The perfect size for takeaway orders. The price is fantastic too. We don’t worry if someone grabs a handful. We say buy a case or two. Keep your overheads low. Stack them and forget them. Love that I can get these in bulk! They look nice at events, and I can use them at the bar, at a drink station, and for desserts! Great for the price since folks seem to go through napkins quite a bit! We use these napkins for our coffee shop! They are great for customers and we also use them for pastries. Perfect size since we don't need big napkins for our store. 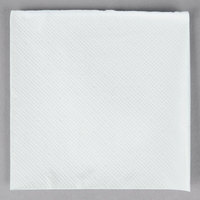 These beverage napkins are 9x9 white 2-ply napkins perfect for a party. Very fairly priced for a high quality product. I will continue to order these. These are great cocktail napkins. They are 9 x 9 white ply. They are soft to the touch and have a beautiful border. They also have pretty roses embroidered on the rest of the napkins. Lovely feel and look for a simple, extremely well-priced beverage napkin. Don't be fooled by the price; these look like they cost way more than they actually do. Would definitely purchase again. Not bad. Thick enough for a modest restaurant but not crazy high end. Decent thickness for a middle of the road cocktail napkin. Will definitely buy again. Great color, great feel, great weight, great price. I wish they were the same size as the colored options..... Overall I am pleased with these. I purchased a lot of colors and love the options I have now. These are nice napkins. They're very thick and embossed with a floral pattern. So they look nice and will absorb a lot of moisture. What more could you ask for? This is a great set of napkins. 2 ply is definitely more effective than their 1 ply counterpart. Not too thin but not too bulky. We love these. These work great for a cocktail party I recently hosted. Good value and high quality product. I have reordered these napkins time and time again. I'm very pleased with these napkins....rarely do I use them for beverages. Great for appetizers, and to use as liners. I order these instead of full size napkins...they tend to go further. Great beverage naps. We buy them in bulk. They hold up fairly well and are great for casual receptions. If your looking for a basic bev nap this is it. Received these faster then I expected. Great quality and an awesome price. Hands down this is the best site to buy Things like this. They were packages nicely and holds up great. Cant wait to use them at the wedding for the Bar. Excellent 2-ply beverage napkins at a great price! We use these in our shop for customers, and they're perfect. They look nice, much better than some of the cheaper napkins that look cheap, and customers end up using twice the amount because they don't provide enough absorption/clean-ability. We find these napkins excellent to use as sides for appetizers. They can take a little wear and tear, but they aren't very durable or good for heavy or saucy foods. It is a nice size. It is good quality. No need to take extra napkins. These napkins works well for our staff and our customers. These napkins are softer and thicker than those we previously purchased from a local retailer. The individual package size is great to ensure that only what is needed is opened. We will continue order this product. Very good quality perfect for havinga cup of coffee & a pastry not to big or to little! We think they are good for our customers!! While more expensive than single ply napkins they are worth the extra money. The look a lot nicer and are sturdier. I use them on a buffet when light snacks are served. I use these napkins for appetizers at parties, drinks, and also to serve with a little slice of pie! They are not cheaply made, and are quite durable. These napkins are a great size. Perfect for dessert napkins. They are pretty and sturdy. They come plastic packaged in bundles which is really handy. These were perfect for a wedding! Crisp white and thick and absorbent, they looked classy and were passed around while serving appetizers and also worked at the bar as cocktail napkins. They work great! They are about 3 inches by 3 inches when folded up which is the perfect size for a beverage or cocktail. Not too thin, they clean up spills very well. I purchased these for customers to use with their ice cream they are the perfect size good quality and priced right for what I needed. I am glad I ordered extra of these napkins because they will be great to have around for all the parties and hosting we do! They are a great feel, texture and love how thick they are. I couldn't find anywhere to beat this price! Very please with the size and the price I paid for. Good quality for every kind of event or occasion , better than buying it in regular retail stores ! Excellent beverage napkin, one goes out with every cocktail. These are very nice and are worthy of a catering display, good quality for the money. Great napkins for really any use. These look great and feel great. They looked really nice with the cake at the wedding, very pleased with them! I never met a person that loves napkins as much as myself lol. I have to have a few napkins to do just about everything and these napkins did everything I need to do! I use these napkins when I do in store demos for our chocolates and ice cream. The size is just right and provide substantive and soft clean up for my customers. These work well for under soup bowls, sauce cups, etc for items on a plate that you don't want to slide around. They are a little "bunched", so I wouldn't recommend them to be used out on a catering table. These are a great buy for a beverage napkin but not our favorite when it comes to absorbency. If you want a thicker product, better to go with a larger size or more expensive brand. The napkin is not substantial but it does the job. I used the napkins alongside beverages, finger foods, and desserts. The utility and price point were a good fit for me. You get what you pay for. These napkins are on the thin side, but worked fine for bar service. I wouldn't use or recommend them for food service. They're too flimsy. Very good price for a 2 ply beverage napkin. This is an area where you dont want to go cheap. Think about the cost per drink - its nothing. Dont cheapen an $8 drink with a see through napkin,. This is a great napkin. It was very absorbent and perfect for my daughter's outside wedding. They were perfect for the bar and dessert. They also are a great value! These napkins were exactly what I needed for my event. They were a nice thick quality napkin and the price couldn't be beat. I used these for beverages and appetizers. Smooth finish and great size for hand-held appetizers. I needed to order a bunch for the catering at a networking event and these did the trick - simple, economical, and sturdy. We bought these to be drink napkins at our buffet style. They are nothing fancy but they are a good weight, nice design, simple, good price. We would definitely recommend these to others! I couldn't decide how many napkins I would need at a large event I am hosting so I ordered some 3 ply colored beverage napkins that I hope will be enough and we will use these white 2 ply napkins if we run out of the colored napkins. Nice enough for a casual event or to have on hand as emergency back up napkins like I am doing. While it may seem like there is not much to say about cocktail napkins, I can say that these are very nice 250 is a lot more than I envisioned! They will be great for serving cocktails at my wedding. Five stars! This is a good, economical beverage napkin. We use them to wrap around ice cream cones before handing them off to the customer. Keeps hands clean. Basic beverage napkin. Great price. It's not the most heavy duty napkin so it can't really hold it's own if serving with hors d'oeuvres. In that sense, it's truly a beverage napkin. Overall, will purchase again. I use these at all of my events whether formal or informal. If you want to make a very good on your guests stagger them with a colored napkin put a glass in the center and twist it. You will see the beautiful colorful effect this will make. We love these cocktail napkins - perfect size. Pack nice and compact for transport but don't feel super cheap. Great quality and value for the price. These napkins look so fantastic at our events. It can get really expensive purchasing these at local party stores and so we keep a stock of these on hand at all times. We used these napkins during our latest wedding reception as bar napkins and they worked perfectly. Naturally, with ice in the cups they sweat, and these napkins held up great. They didn't shred all to pieces after a couple minutes. These napkins are soft and durable. Will definitely buy again when the time comes. It also is very pretty with a design. it is of great quality and value. Nicer, thicker, softer napkins. Not a cheap scratchy napkin. Actually absorbs cup moisture. Not big and bulky either. It a napkin that does what it supposed to do! I've purchased this napkins multiple times. I would give it five stars, but it's a little on the weak side. I use it for catering and don't think that one napkin is enough for dinner. What can I say? These napkins did exactly what I expected them to: no bells or whistles, but got the job done with no tears or leaks. Simple white cocktail napkins, but plenty of them. They are a nice thickness and do the job. They seem thicker than the ones I have bought locally. I would definitely buy them again. These are an okay quality, but I would only use them on lesser occasions . These seem smaller than your ordinary cocktail size napkin and the look a little skimpy. Nevertheless, they worked okay for what I needed. These napkins are soft and sturdy. The price is right and the product is quality. The Choice brand stands up well against any other I have used. Good quality & great price. Bright white looks clean and crisp. Nice weight and attractive edges. Perfect size for bar napkin bins or to use for appetizers & desserts. Great value. Great value and great for serving with drinks or passed appetizers. We also use them as napkins for meals at our restaurant and they are a little thin and small for this purpose (although we keep using them because the value is great!). They are very soft and tissue-like. These napkins from WEBstaurant Store cost a fraction of what other retailer are charging for similar items. They are useful for appetizers as well as beverages. We will definitely stock up on these because of the amazing price. Great quality napkins to be used for multiple events at our office. Glad I purchased a whole case, we will get lots of use out of them for our special quests. These are very nice napkins and just what I was looking. The price for 250 2 ply napkins is truly a bargin. I would highly recommend this product. We converted from expensive colorful napkins, to these plain white ones and they're fine. They're inexpensive and get the job done. I'll never go back to expensive napkins. A little smaller than expected but very nice thickness and feel. Will be just right for cake table at wedding reception. Would recommend to anyone that needs an appetizer or beverage napkin. These little white napkins are small and thin, but they are perfect for taking with your coffee, or a cookie, or a drink. Just enough to get a small job done. We used these.Functioned to accompany appetizer and drink. Napkins are not as thick as I expected! did the job. No complaints from clients! will order again. These bev naps are very nice. They hold up well and have a nice weight to them. We only use them as liners between plates, but I would purchase these again. When we held our employee appreciation event night a few months back I purchased the products to save money. I used these napkins and they worked like a charm. Great product. These are great cocktail napkins! They are absorbent and perfect for beer, cocktails and wine glasses! Great alternative to bulky drink coasters! We use them at the bar and on the table!! Very economical napkins. Good quality, good absorbency. You don't want to spend a lot of money on napkins that are only going to be used once (if at all). But these will easily do the job. Serve one with every drink. These are a bit flimsy; truly just a beverage napkin and not to be used for appetizers. But for the inexpensive price, if what you want is a napkin under a beverage, this is a good deal. These napkins are fine. They are of a medium weight and look pretty nice. The package size is convenient and the size is useful for many applications. The 2 ply white bevy napkin that works perfectly under a drink. The napkin is bright, doesn't look dirty and comes in convinent smaller packaging. These napkins are ok but they are not identical to the colored ones carried by Webstaurant Store. The packaging also squashed the corners of some of the napkins at each edge of the pack, rendering those useless. The look of this 2 ply beverage napkin is what makes us pick this over others. The napkin serves it purpose and is easily dressed up with other colors on the table. Again, another standard item we use a lot of in our restaurant that I've been blindly ordering from our traditional suppliers. But a quick check on Webstaurant saves me money a case even with shipping. Delivery time is super fast-never had damage, and have never been disappointed with quality.